There are a few simple things that you can do to revamp your home without needing any drastic renovations. We’ve included 10 of our favourites, including a few that our customers love, but if you have some ones of your own to include then please add them in the comments section below! These are all relatively small jobs, that don’t cause disruptions or require a lot of time. If you want some more radical changes then you’ll be wanting to think bigger. This one is all the more important if you have a metal or wooden fence at the front of your house, because then it is the first thing that people see when they approach your house. 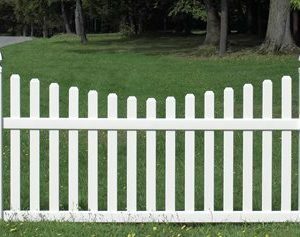 But so often people have a fence that has been left exposed to the elements, or it’s been painted with a sub-standard product and it ends up looking old and worn. They often get forgotten about, but a fresh coat of paint will brighten up the outside of your home, and you’ll be amazed at how much nicer the whole house looks as a result of it. There are a lot of products to choose from, and a vast array of colours that can work to suit your needs. 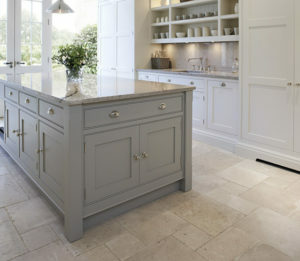 Getting a whole new kitchen is very expensive, but if all you’re after is a fresh look then a new coat of paint to the units and worktops can make a big difference. Painting the surfaces yourself also means that you can add personalised features, like a chalkboard surface, or a stencilled design. Because kitchens are often subject to the most difficult wear and tear, because of a combination of frequent cleaning and exposure to oils, acidic and alkaline items. So it’s important to use the right products. For the units Fassilux is one of our favourite products because it can be made to any colour and it’s high quality so it lasts a long time. There’s even a kit specially designed to paint worktops, that creates a durable and decorative finish. Damp is not only problematic for a home, but it also mars the look of an otherwise well decorated room, particularly in bathrooms. There are a lot of products that you can use to cover up the appearance of damp, but the best thing that you can do is to stop it from appearing in the first place with a well chosen primer. While damp can happen anywhere some rooms are more prone to it than others such as bathrooms and laundry rooms. These rooms also tend to be some of the most difficult to redecorate because of the appliances and plumbing in these rooms. So if you can make sure these rooms are protected from damp then you’ll be able to keep your finish for a long time. if you do have damp in any of your rooms then a special primer and topcoat combo will give you great results. The parts of your house that you think nobody will notice when they’re looking shabby? Those are the parts that make a home look finished when they’re done properly. So yes, it’s definitely worth spending some time on the little bits. Window frames, door frames, skirting boards etc. all make much more of a difference than you may think. Even small areas like cabinet legs, or the inside of a draw can add that little touch of something special that everyone is trying to achieve. 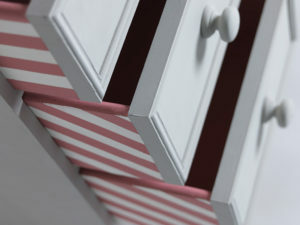 The aerosol ranges and the furniture paints are ideal for this. This really ties in to my earlier point about detailing, but if you can have a theme (not a rigid theme, but just something small that runs through the house) then it can really bring the house together as a home. Every room of your house may be painted in different colours, but they could all have something in them that relates to a theme. The theme could be a colour (a neon, a metallic, or just a personal favourite), or the theme could be focused on a subject (coastal, floral, or even based on a favourite place). For example if you had a gold theme then you could add gold accents in each room. For some rooms accents can be something as small as cushions or photo frames; other rooms could embrace it further with feature walls for coloureds furniture. If we stick with the gold theme, the gold aerosols, and glitter feature wall paints would give you good continuity. A lot of people mistakenly think that once something has gone rusty then they just have to live with it that way, but that’s just not true. Paints like combicolor are designed to go onto rust and give it a new lease of life. Typically the places where rust gets noticed the most are in the garden. Tables and chairs, especially is they’re left outside and expose to the elements, will have noticeable signs of rust. But if they’re treated properly then you’ll find that they hold up a lot better. Rusty areas make a home look wrongfully old, so don’t just leave them. A quick coat of paint will smarten things up, and it is way easier than you think it will be. 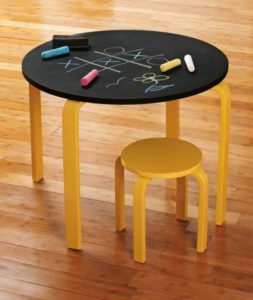 Whiteboard and chalkboard paints have been getting more and more popular over the years. Not only are they great for in kitchens, where it seems everyone needs a space to make lists, but they’re also brilliant in children’s rooms. The clear whiteboard paints give the illusion to children that they’re writing on the wall (which they love), but you can then just wipe it away (which parents love). Write-able paints are a great fun feature to add to your home. If you have some old tiles that you’re bored of it’s common to think that changing them will be very time consuming and expensive. But this doesn’t have to be the case. If your tiles are just in need of a little TLC then items like the tile transformation kit, or the Tub & Tile are easy to use and give great results. If you’re looking to do something more specific, then use a primer that will stick to the tiles, and then overcoat with the paint of your choice. Many of them can be made to any colour. 1. Don’t do it all at once, focus on the rooms you’re in the most. For me, if I wanted to give my home a fresh look it would take a lot of effort. But by breaking it down into the rooms that I spend the most time in it suddenly gets a lot easier. The person that’s going to notice the difference in your home the most will always be you. So do what you will most appreciate! If you spend a lot of your time in the kitchen then start their, if you spend a lot of time in your bedroom then look for the little changes that you can make. Everything is a much smaller job when it’s broken down. Trust the old cliche: Rome wasn’t built in a day. So don’t try and do everything at once! If you’ve got any questions, or any ideas on how to revamp your home that you want to run by us then just give us a call on 01902 710057,or send us an email to info@andrewscoatings.co.uk.